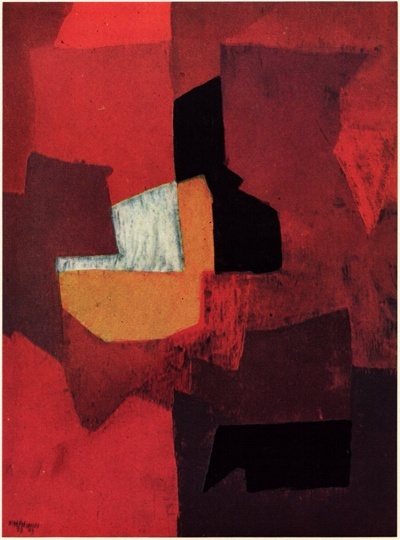 Three paintings by Serge Poliakoff reproduced in Michel Ragon’s 1958 Poliakoff. “How can we describe a picture by Poliakoff? It is, for instance, a surface in which are incorporated a rounded and a right-angled shape. But all about it is asymmetrical. It is a fact that this type of painting is very hard to describe; for it is made up of nothing. No memory of known shapes can be found in it. It is the world of silence and of ‘pure painting’. How can one describe silence?” (p12-13). Oil painting, 1952 (p19). Click for larger version. 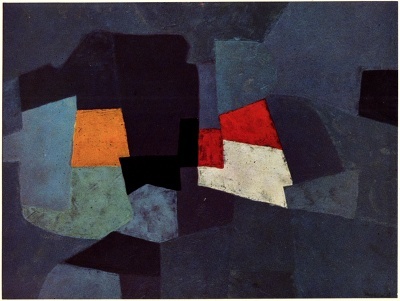 “A Poliakoff picture generally comprises a few simple shapes. A kind of light emanates from a central mass. The passage of the colors from dark to light and the effort of vibration in the texture are two characteristics of his pictures. “A Poliakoff picture has no depth, no ‘sky’, no perspective. Thus, in the same picture, a yellow may be hollow or in relief. And a red placed next to that yellow can likewise be hollow or in inverse relief. “The reason is that his forms stem from space, and space, as he likes to say, ‘creates the form'” (p31). Oil painting, 1953 (p23). Click for larger version. “Next to space comes the matière. 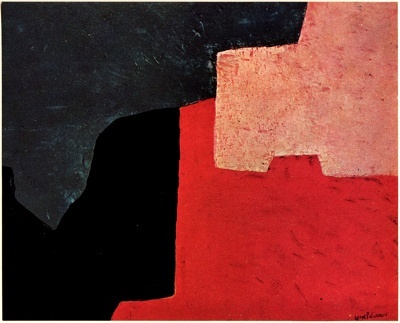 Poliakoff covers his canvas with successive layers—three or four at most—of thin paint, applied with extreme sensitivity. His creations, which owe nothing to organic forms, thus produce a curiously sensorial impression. “This effort to bring the paint alive is characteristic of Poliakoff’s work. “‘The matière of all the great painters lives’, he says, ‘even in the case of Malevitch. I was much struck when I saw his famous white square on a white background. It proved to me once again the outstanding part played by the vibration of the paint. Even in the absence of all color, a picture whose paint vibrates, remains alive'” (p34). Oil painting, 1956 (p41). Click for larger version. “This ‘pure painting’… is the painting of silence. The Poliakoff miracle is that he knows how to make silence vibrate. “‘When a picture is silent, it means it is all right. Some of my paintings start making an infernal din. They are explosive. But I am not satisfied until they have become silent. A form must be listened to, not seen'” (p36). I was quite intrigued about your hobby and wanted to read your blog. I am still trying to comprehend your analysis. Just had to pass through here to comment, both because after reading I’m fascinated by your perspectives on art (love it myself and consider myself knowledgeable enough to be dangerous ). I also wanted to circle back with you on something after our chat at Wisdom 2.0 … if you have a moment and can drop me an email would greatly appreciate it! Please. That isn’t art. An elephant could make that. Poliakoff works are to me an expression of silence, a beauty where the ‘self’ is not, beyond vanity and ambition a true, honest creative mind, paintings of silence.